It is fair to say that radio astronomy truly revealed an invisible Universe, and then frustratingly provided evidence for an even-more hidden Universe that even they can’t see. Dark matter makes up a larger portion of the Universe than the matter we know and detect around us. For decades, “dark matter” was a footnote, and few pursued Zwicky’s course until a remarkable discovery in the 1950s proved him right. Astronomers Vera Rubin and Ken Ford used a sophisticated spectrometer to clock the subtle shifts in spectra of stars in spiral galaxies near and far. They measured stars outward from the cores of these galaxies, to get an idea of how fast galaxies like our Milky Way must spin and how that spin decreases the farther from the core they clocked. Contrary to centuries’ old physics, the outer stars were not orbiting more slowly than the inner stars. Rubin looked to Zwicky’s dark matter theory and found a solution: to balance their speeds out to those distances from their massive central cores, the galaxies must be made of more stuff than just that which we can detect. Using the 300-foot radio telescope in Green Bank, Mort Roberts found huge halos of invisible hydrogen gas extending well beyond the visible disks of these galaxies. By clocking that gas, he and others extended the flat rotation curve several times the diameter of the visible galaxy. Clearly, he proved, galaxies are made of much more matter than can be detected by even the largest radio telescopes. Large dish radio telescopes, such as our GBT, continue to help us infer where dark matter is based on how it effects the visible matter around it. And the VLA’s detailed radio vision has captured lensing effects caused by concentrations of matter warping the passage of light from behind them. 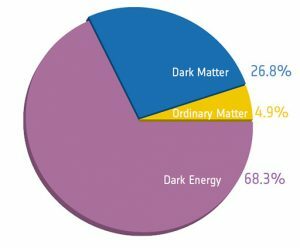 Decades later, and physicists agree that 25% of the Universe is made of dark matter. Less than 5% is visible, detectable matter like stars, planets, you. The bulk of the Universe is Dark Energy.